Our undergraduate and graduate degree programs prepare teachers to be knowledgeable and competent leaders in their chosen educational field. 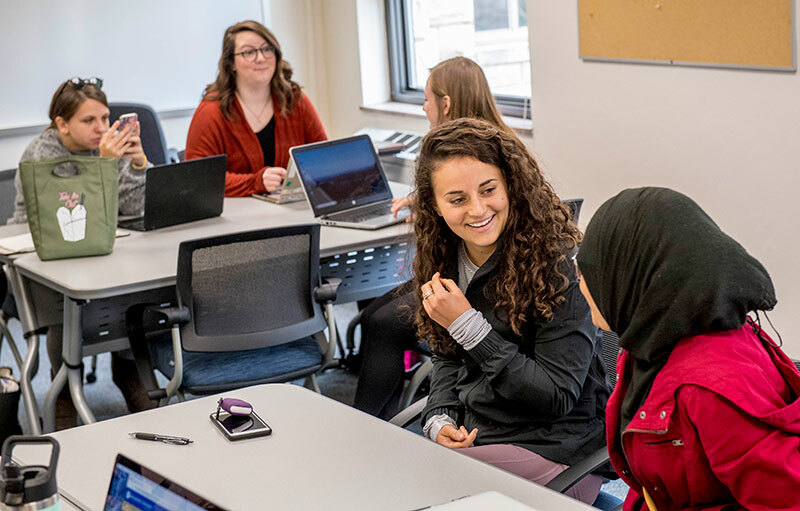 Students in the School of Education at Rockhurst engage in diverse field experiences early and often throughout their studies as they become more knowledgeable and competent educators. After completing their program, Rockhurst graduates work and serve as reflective and innovative educators. Top rated. The Missouri Department of Education rates our program in the top tier for certification assessment pass rates and student content GPAs. Learn from the best. Our faculty members are experienced teachers and administrators in K-12 schools. Small class sizes. This means more one-on-one attention from our world-class faculty in the classroom and in a mentor-mentee relationship. A Jesuit education sets you apart. Develop professionally and personally in our Jesuit tradition of learning, leadership and service. Expand your network. Connect with professionals throughout Kansas City and beyond. Student teaching can be completed in Kansas or Missouri. You’re not alone. When the time comes, we consider your job search a team effort. Flexible points of entry. Start taking classes in the fall, spring or summer semesters. Whether you want to start a new teaching career or advance in your current position, our Master of Education degree can get you there. Our program offers certification in elementary, secondary, or special education. We also offer an educational studies option for those who already have a teaching certificate or do not need a certificate. You’ll be happy to know that Rockhurst’s Master of Education program received Top-Tier Status in 2016 from the Missouri Department of Elementary and Secondary Education (DESE). The program also celebrated a Kansas Horizon Award winner and a Missouri Outstanding Beginner Teacher Award in 2017 – awards that honor excellence in the first or second year of teaching. Here, we develop educational leaders - teachers who are actively engaged in educational matters as reflective practitioners. Through rigorous coursework and varied field experiences, you will acquire a deep understanding of, and special sensitivity to, the challenges and rewards of teaching in K-12 schools. We purposely keep tuition rates competitive with other programs in the region to give you the most return on investment. Learn more about our program options. Learn more about how our programs focus on moral reflection and teaching for social justice in our department’s conceptual framework. Throughout your time as an education student at RU, you’ll be building a portfolio to showcase your development in educational theory, research and practice. It’s a way to measure your skills, reflect on what you’ve learned, and, of course, show off what you’ve accomplished. Your journey to becoming a teacher or educational leader ends – or should we say starts – with a capstone project prior to graduation.